Apple’s continued testing of its latest and supposedly greatest version of iOS rolls on. Two weeks after introducing the initial iOS 9.1 beta to registered developers, Apple has today flicked the switch on yet another release that sees the second pre-release seed of iOS 9.1 fall into the hands of testers. It’s immediately evident from the firm’s release schedule that the Cupertino-based company is passionate and extremely keen to eradicate any bugs that have made it into the public domain with iOS 9. Registered developers and those looking to get involved in the testing of iOS 9.1 could be forgiven for being more than a little overwhelmed. Individuals who regularly test Apple’s platforms in the hope of locating and filing bug reports have been inundated recently with pre-release seeds of not only iOS and OS X, but also developer tools like Xcode. There’s also been the release of tvOS and the associated SDK for those developers to sift through and get to grips with before they start developing apps specifically for the Apple TV 4.
iOS 9 GM went live immediately after Apple’s recent media event in San Francisco. In what was a semi-unusual step for the company, that initial GM was also accompanied by an immediate first beta of iOS 9.1, available to registered developers and then later to those who have registered themselves as part of Apple’s Public Beta Program. That was almost two weeks ago now, giving Apple and its relevant engineering teams more than enough opportunity to further developer iOS 9.1 and remove any bugs that have been reported and deemed service affecting. 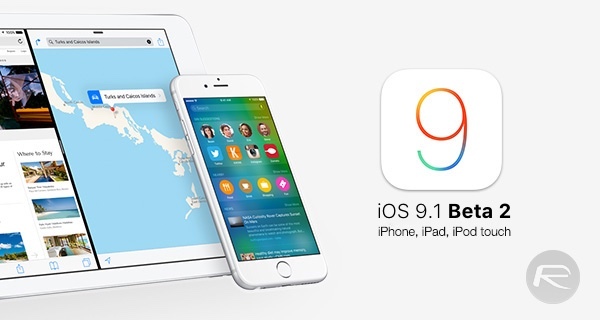 At this point we don’t know a great deal about the second beta of iOS 9.1 and all that it entails. Apple does a fairly good job of abstracting away any in-depth or intricate change logs for its beta software releases. Given the fact that Apple has already announced that the new iPad Pro will come with iOS 9.1 pre-installed on it, it’s probably worth while taking the time to delve into the intricacies of the software and see exactly what you’ll be doing with if you plan on building apps for Apple’s new powerful iPad Pro. As always, the actual download seed of the build is available via Apple’s developer portal for those who are registered. If you’re already running the initial pre-release seed of iOS 9.1 on a test device then the latest update can be downloaded OTA via Settings > General > Software Update. We’ll be digging into the firmware as soon as possible to bring you any important news or updates about iOS 9.1 beta 2. I’m on 9.1 beta 1 but I’m not getting any update notification. Apparently my phones up to date. On iOS 9.1 beta. Still don’t see an update. It’s up for me now.